With more and more electrical equipment and services being installed in offices and commercial buildings, there is a greater risk of electrical fires occuring. Only certain types of fire extinguishers should be used on electrical fires. The only types of extinguishers to use on electrical fires are CO2 Fire Extinugishers (Carbon Dioxide) or Dry Powder Extinguishers. This is because water and foam fire extinguishers should not be used for electrical fires as they would give a risk of electricution to the user, as the water and foam would conduct electricity back to the user. As CO2 Fire Extinguishers and Powder Fire Extinguishers don’t use a conductive extinguishant medium, they are both suitable for use on electrical fires. 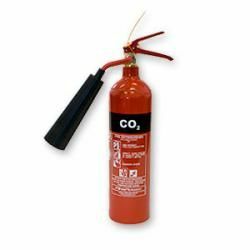 CO2 Fire Extinguishers come is a 2Kg CO2 Fire Extinguisher size and 5Kg size. Powder versions generally come in 1Kg, 2Kg, 4Kg, 6Kg and 9Kg sizes which all give a different fire rating dependant on the size. If you’re interested in CO2 Fire Extinguishers you may also be interested in our fire alarms and fire blankets ranges.